Sandberg in Frankfurt: "I come with very good news. We're the only company in Silicon Valley that's not building a car." 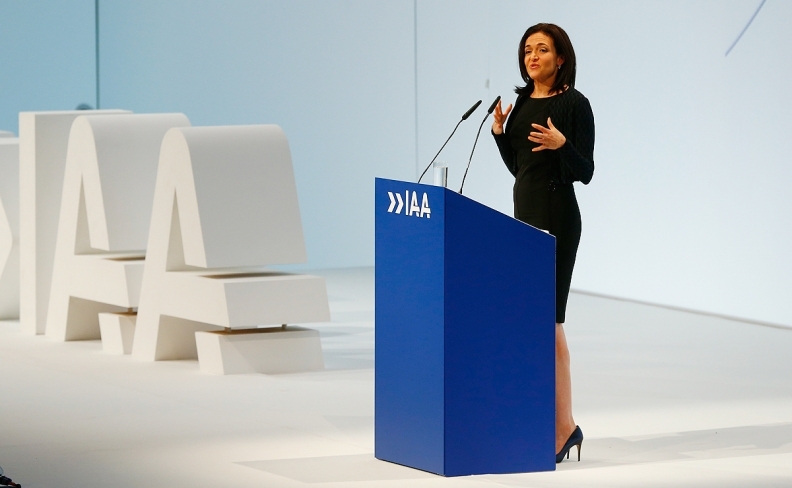 FRANKFURT -- Facebook COO Sheryl Sandberg went on a charm offensive in Germany on Thursday, telling the country's powerful automakers that the world's biggest social network does not want to compete with them. "I come with very good news. We're the only company in Silicon Valley that's not building a car," Sandberg said to laughter and applause at the opening ceremony of the show, where she met German Chancellor Angela Merkel. Describing Facebook as a "teenager" Sandberg told carmakers, "We have a lot to learn from you. We don't have your history, we don't have your staying power, even though we aspire to make it to 100 years." Facebook is sponsoring a "new mobility world" in Frankfurt that brings together carmakers, tech companies and start-ups in areas such as autonomous driving and electric cars. The tech company has vowed to deepen cooperation with automakers including Daimler and Volkswagen Group and says it is seeking closer ties to the automobile industry and is issuing an invitation to work with the industry on topics including artificial intelligence and bringing the industry up to speed on digital tools. Sandberg announced that Facebook will join an urban mobility test project in Munich with carmakers and start-ups and said it will also sponsor a new university in Berlin focused on digital product development. The lines have blurred between the car and technology industries as vehicles get smarter, packing in dozens of chips and software to assist drivers with everything from respecting the speed limit to parking. Autonomous driving is expected to be the next frontier, prompting companies from Apple to Samsung to strike deals and invest billions of dollars into their own self-driving projects. Automakers including BMW, Audi, Nissan and Toyota are experimenting with autonomous driving as well, and some are discussing a common platform. The Frankfurt auto show has shown that the industry may have more immediate priorities though, like electric cars and using technology to add premium features to human-driven vehicles. Sandberg's visit to Germany comes after the country's parliament passed a law in June to introduce fines of up to 50 million euros ($59 million) for social media networks if they fail to remove hateful postings promptly. On Wednesday -- when Sandberg was attending a marketing conference in Germany -- Facebook tightened its rules on who can make money from advertising on its network to make it harder for providers of fake news and sensational headlines to cash in. "We take our responsibility to the people who use our products, to the countries in which we work like Germany, to society at large, very seriously," Sandberg said on Thursday.